The past six months in particular — since our house went on the market in April and we moved to our new house in May — have been really challenging, made only more challenging by the fact that I have been pregnant this whole time and couldn’t help Luis with a lot of the burden: maintaining the physical and financial aspects of two homes (and dealing with problems at both), mowing the lawn/landscaping two homes, moving (out of the old and into the new), unpacking, fixing things … I did what I could to pitch in but realistically I ended up keeping an eye on Maya far more than making a dent in unpacking. It’s been unbelievably stressful on both of us — I would venture to say the most stressful six months of our entire thirteen-year (!) relationship, surpassing even years of being in a long-distance international relationship and his nine-month deployment to Iraq in 2005. Well, this weekend, we were able to breathe a [small] sigh of relief when we signed the rental contract with our realtor. No, it wasn’t the final sale we were hoping for, but a year-long lease (with the tenant allowing us to re-list in the spring when the market here hopefully picks up) gives us a little breathing room and also lifts the burden of Luis maintaining two homes throughout the winter. A-MEN. In addition to the rental of our home panning out, this weekend wrapped up a huge work project for me: our annual digital client summit in Chicago. This summit takes about six months of planning each year and while it always goes great in the end, there’s a lot of pre-event anxiety on my part as event planner/organizer — especially since, this year, it was so close to my due date. Fortunately, I was able to be there to see it through and it was, as always, awesome. (Our speaker was Jonah Berger, best-selling author of Contagious: Why Things Catch On). 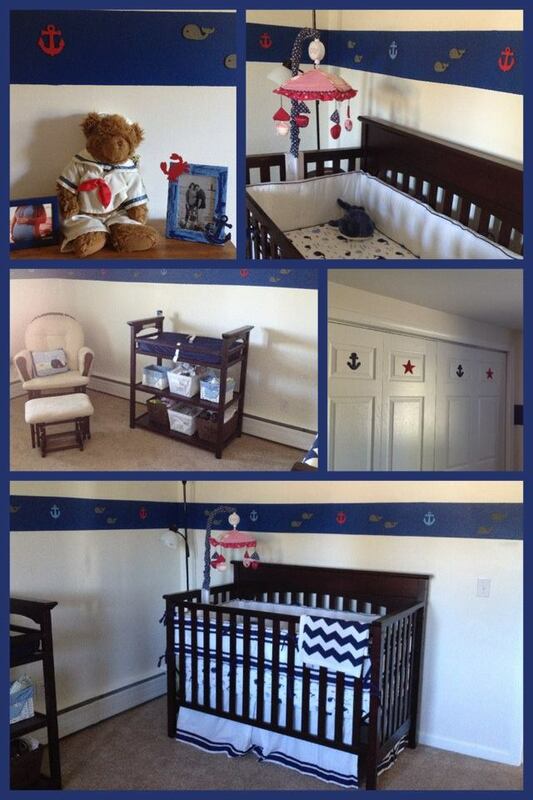 And … the pièce de résistance of the weekend … the nursery is finally ready for prime time and its little tenant. I think what I love most about Baby H’s nursery is how much I actually was involved here, considering my inability to do so much right now. Luis painted the navy stripe for me while Maya and I were in NJ last month, but the nautical/whale theme was all mine, and all the little wooden embellishments were painted and hung by me with TLC. It’s a room fit for a little king, who will no doubt be loved to pieces by all who know him. So now we can exhale just a little bit. I know we’ll still have to get rid of our other house in the spring, and I still have seven work days ahead of me, and still have to deliver said king … but all in all, I feel like a huge weight has been lifted off my shoulders. Facebook has those annoying emoticons now, but I actually used one yesterday for the first time: “wonderful” … Because I actually DO feel “wonderful” in this moment. And it’s been a while since I could honestly say that. So Baby H, stay tucked in there safe and sound another ten days … we’ll meet you soon and we’re as ready as we can be for your arrival! Now if only we could agree on your name … (Pssst, we’re getting close! ).